The 22-year-old University of Virginia student from Cincinnati spent more than a year in North Korean detention after being arrested for stealing a political poster from a hotel. Seoul: North Korea released US student Otto Warmbier "on humanitarian grounds", state media said Thursday, two days after he was evacuated from Pyongyang after falling into a coma while imprisoned in a labour camp. The 22-year-old University of Virginia student from Cincinnati spent more than a year in North Korean detention after being arrested for stealing a political poster from a hotel. His family have said he was "terrorised and brutalised" by Kim Jong-Un's regime. 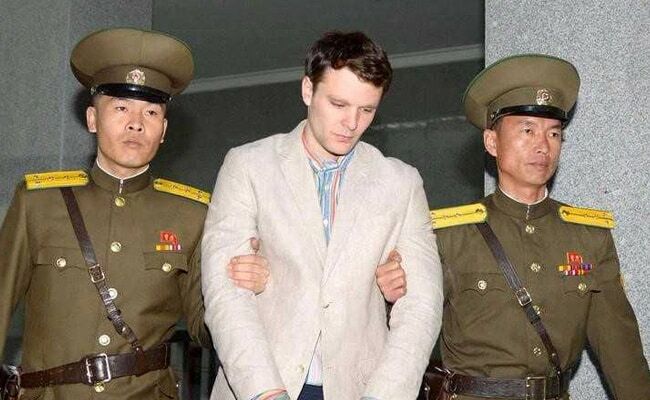 "Otto Frederick Warmbier, who had been in hard labour, was sent back home on June 13, 2017 on humanitarian grounds according to the adjudication made on the same day by the Central Court of the DPRK," the state-run Korean Central News Agency said in a one-line statement. Warmbier's release came after a flurry of secret diplomatic contacts between Washington and Pyongyang, which culminated in Joseph Yun, the State Department's special envoy on North Korea, travelling to Pyongyang to secure Warmbier's release. "Joseph Yun went to Pyongyang to accompany Mr Warmbier home," Thomas Shannon, undersecretary of state for political affairs, told reporters in Seoul Wednesday. Warmbier's parents Fred and Cindy have said that they were told their son had been in a coma since March 2016, allegedly after falling ill from botulism and being given a sleeping pill. "Otto is not in great shape right now," Fred Warmbier told Fox News Wednesday. Warmbier had been sentenced to 15 years of hard labour, a sentence the US decried as far out of proportion to his alleged crime, accusing the North of using him as a political pawn. The New York Times reported a senior US official as saying the authorities recently received intelligence indicating Warmbier was repeatedly beaten while in custody. The release came amid tension between Washington and Pyongyang following a series of missile tests by the North, focusing attention on an arms buildup that Pentagon chief Jim Mattis on Monday dubbed "a clear and present danger to all."